Why board games? What kind of market is that? Because it’s a competitive market dominated by big corporations and high expectations, yet it has some sweet spots available to anyone, and with a decent funding we can get there. It’s a lucrative business with very high margins if you optimize well. First of all – Cryptum is not only about board games. Sure, if we don’t sell 150 000 + CRTM, we will only fund the games project and the upcoming Cryptumcoin, and pass on the mining farm, but this is a low target in a world where everyone and their mother pays millions for any ICO that is decentralizing or revolutionizing something. And while we do not decentralize the board gaming business, because Kickstarter already did that for us and we are better of using a ready popular service, we definitely make a quite, if small revolution on the board games market. We are funding a series of games, but more importantly – the first serious crypto mining game, and we are funding them in the in the crypto world. Yet we will then sell them to the unsuspecting hobby market, which, as you will find out below, is much bigger than you think. That’s just A – creating something with the money already on the cryptocurrency market, and B – making more money and bringing them back to the cryptomarket. 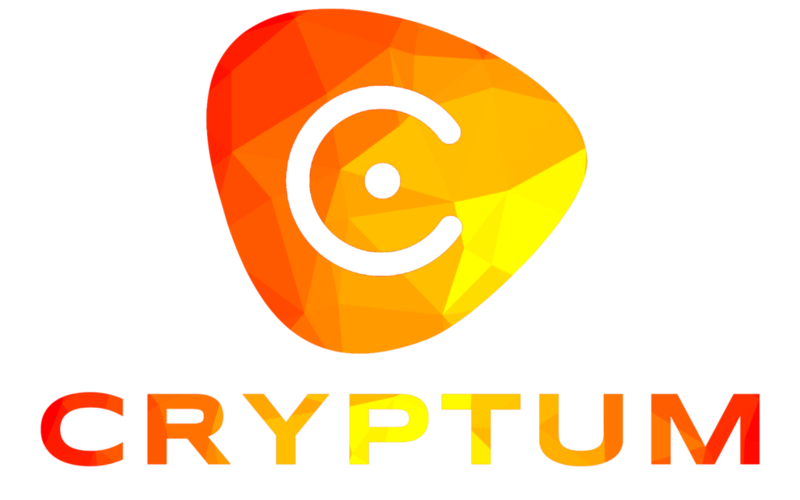 The side effect is that some people that have the required number of Cryptum Tokens can claim their free games for free AND receive portion of the profit. And if after all we sell 150 000+ CRTM, we will have a long-term solution for our needs and your profits provided by mining on the larger scale. You can find more info about the mining project in its category, we will not talk about it now, suffice to say it pays back as everyone knows. You probably saw Catan in the bookstore or you played Monopoly with friends. Or Risk. These are mass products, yet they are regarded as junk in the hobby. There are thousands of new games each year. And a good portion of them cost well over $50, with bigger games already passing the psychological barrier of $100. The board games are SO popular that companies started porting them to mobile devices, mostly iOS, but some are available on Android too. And these are also very successful. Of course, we will port Blockchain if we can. We are even partnering with the right company that can do it. Up until recently the tabletop market was a niche market that didn’t saw much growth. Then, just a few years ago, it simply exploded. One of the reasons for this expansion was the crowdfunding – not by simply allowing more funding (crowdfunding total is still low in the overall scheme of things), but by making the games more and more popular, and allowing the creators to sell them in retail later. It allowed any individual to fund his creation by pre-selling it, and while it also created an initial rush of lower quality games (similar to the current ICO market? ), eventually people started funding only good games. And often this is also the expensive ones. Kickstarter turned out to be a great marketing tool, and the prices to manufacture games got lower and lower. Average printing cost is around 25-35% MSRP shipped. Some games are more expensive (especially those with plastic miniatures), other are dirt cheap, selling at 500+ % their cost. Average wholesale price is 50-65% of the retail price. Kickstarter prices are 90-95% of the retail prices, but there is also the Kickstarter fee. Still, selling directly to customers is much better than selling games to distributors around the globe. At any rate, this leaves a lot of money in the hands of the creators if they play their cards well (pun intended). But then they usually have to pay for the development, art (it’s expensive, similar to the advertisement in the ICO world), or 3D design if it’s needed, so they always have expenses to cover, making single game ventures less promising. This is just before the explosive growth started. It was a 1.2 billion market in US & Canada only in 2015, and these are the most advanced markets so far. But games are also popular in Europe, especially UK and Germany, and they gradually spread around the world, raising the global market to nearly $5 billion. According to recent research, the global market is heading to $8.12 billion in 2021. We will enter the market at the right time, during enormous growth age of the games. And then there is the Kickstarter expansion – the amount of money to be raised there by 2020 is staggering, considering we are still talking about products with fairly low popularity, and it’s only limited by the number of people using the platform, But this number grows daily, because it’s in everyone interest to make it more popular. The more people pledge in a game development, the more stretch goals are unlocked, and the game receives a chance for better quality of the print. This is where we want to enter it. If we follow the regular path of game funding, we will have to invest in its development and creation process, and then raise the money in a campaign or sell it to some publisher. But that doesn’t necessary mean we would reach the retail market (and the big volume is there) or that we will have enough funds for the next game. By funding the business on the blockchain, we will start working faster and with better quality, earn more profit and pay it back to token owners. We will circumvent the whales, and sell to customers through funding campaigns that actually promote the games and make them easier to sell in the retail later. We are approaching a profitable market with a sound business plan. 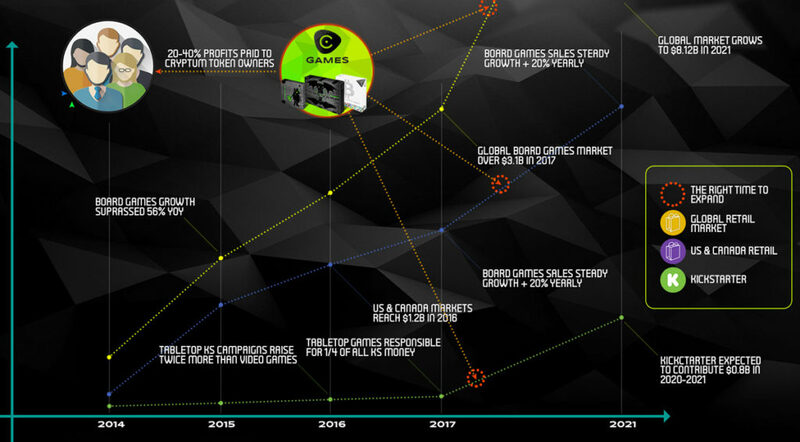 Even looking at only the 4 games we announced and their expansions, it is possible to generate over $2 million of revenues, and with that it is easy to get the train rolling faster, thus making more, and that’s not even considering the growing retail market. There are plenty of games selling over 30 000 copies, and this is where we want to go, instead of climbing the market tree slowly by printing small quantities. Why we need the blockchain? Because we don’t just want some money to start the business and leave you with lousy tokens you can only sell. We offer some features, like free games, shared profits and even initial amount of new cryptocurrency, and they all require some form of proof-of-ownership we could easily place on the blockchain, instead of creating new technology for it. It’s simply the path of least resistance. We do hope this article settles the questions regarding our choice of products and the project technological suitability.